life with emilia: five months in. I know that I say this all the time, but HOW AM I WRITING THIS UPDATE ALREADY. Like how. How is she 5 months? Also, something else that I say often, but feel that it’s true right now: I think this is my favorite age for her. This stage, where she is such a delicious little chunk, so roly poly, so giggly and smiles at everything I say, but isn’t quite on the move yet? GAH. She is just edible. I adore her. This babe is just the best! A quick schedule rundown because I know you guys like those: in general, she goes to bed around 730 or 830 and is up for the day around 630 or 730 (not sleeping the whole way through though – more on that below!). She still takes three naps (sometimes even four) and her first and second are usually long ones, with the third nap being a little shorter and much closer to bedtime (like around 430 or 5PM). That’s our loose schedule, but I don’t freak if we’re off schedule slightly. I am so grateful that Max still adores her. We haven’t had any jealousy yet (but of course she isn’t at the age to steal his toys) and he constantly asks to “play” with her. Meaning, he gives us both cars, he gives her toys, he asks us to sit on the floor and play with him. When she does tummy time, he does tummy time. When she is on a play mat, he is there with her, playing with the toys above her head. He is just so kind to her! We talk about him being kind a lot – with other kids, animals, etc – so I don’t know if it’s that. But he is just so sweet. Last week, Max had some sort of stomach virus (truly awful) and I went to great lengths to keep them away from each other. Max was pretty sick so he didn’t notice much, but Emilia could tell. For over three days, she just kept staring at him from across the room with this HUGE smile on her face, trying to get his attention. She missed him so much! Sleep is just… sleep. I’m just being positive about it. She has not gone back to the 8 to 10 hours that she did before she was four months old. I hate to say it, but I’ve even let her cry it out a little bit. Some of it has been unintentional (like I’ve been in the middle of something with Max that I can’t leave at that very second, so she cries for a bit) and a few times it’s been semi-intentional to see if it helps. It’s like the gentle cry method, where you go in after 3 minutes, 4 minutes, etc. The good news is that she goes down like a champ. She doesn’t want rocked. She just wants to be placed in her crib, left alone. It’s absolutely crazy to me and completely different from Max. And she falls right asleep on her own! Occasionally she will lose the pacifier and I’ll go back and put it in, but not even every time. She falls asleep easily and that is great. The (kind of but barely) bad news is that she still wakes up at night… a lot. Sometimes it’s every two hours. Sometimes it’s after four, then every two after that. She isn’t going much longer than five or six hours for a stretch, but you know what? That is still FOUR hours longer than Max ever went! For some reason I am SO much more tired this time around, but I’m also so obsessed with her that I want to hold her at night when she wakes up! Because time is just flying. My struggle at night has been to feed or not to feed. I can tell the difference – when she is really hungry and when she just wakes up because she is still struggling to soothe herself. And those times when she wakes up and isn’t necessarily hungry, I am SO TEMPTED to just nurse her because it means we can both go back to sleep in a few minutes. When I don’t nurse her, it takes a bit more time to settle her. I’m trying to not be in the habit of feeding her all night long (obviously) like Max did, so that’s only the part that is rough right now. We haven’t started food yet. My doctor said we could start cereal at four months if we wanted. 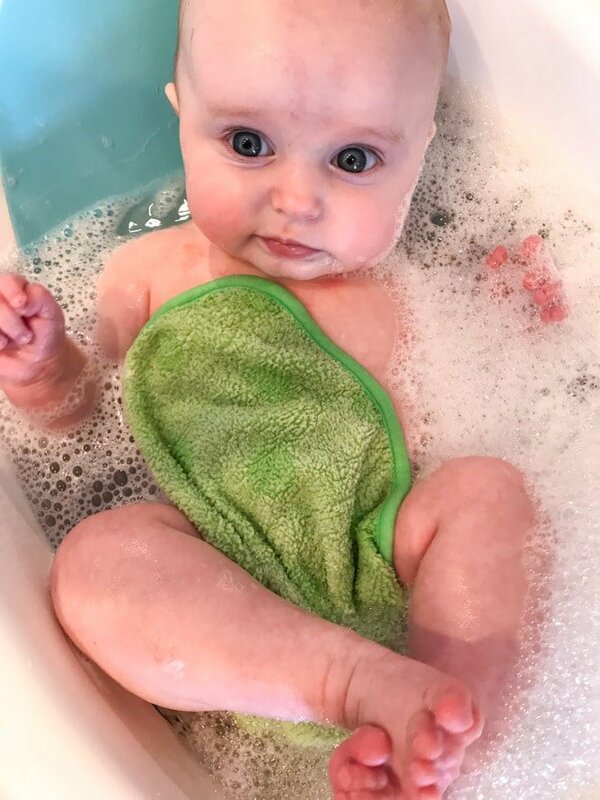 I waited until six months with Max and did baby led weaning. I’m waiting until a little closer to six with her, but she is SO interested in food that I may give her some purees this month! Her personality is my most favorite thing. I like to think that she is already a crazy person (scorpio!) like I am, since our birthdays are only three days apart. I mean, I’m (half) joking. This girl never has a small smile. She has a huge, open mouthed smile when she is happy – all the time. And when she is not happy, she flips out. She is so intense in her emotions already that I love it, haha. Is that crazy? Also, I swear she is trying to talk already. She chats and talks and screeches so loudly the entire day. Max did that too, of course, but it seems like she is doing it SO much more than he is. Maybe because she hears us talking all day long. We absolutely love it and she pretty much “talks” to us all day. It’s the cutest thing. While having two kids right now is hard, I am used to it and love it so much. Everything takes a million times longer to do, but I love how FULL life seems and how loud it already is and how crazy it can be. When I have a moment of melting down (often! ), I just remember that it’s not going to be like this forever. It’s not even going to be like this for a few years. Max will be in school soon and he won’t be around us all day long (I can’t even talk/think about it!) and the new normal is constantly changing. I want to be immersed in this all, the good and the bad, and feel alllll the things. I know that sounds crazy, but it’s this weird part of like that I never knew I wanted so badly or would love! She looks like SO many different people at this age. On the regular, she looks like Eddie’s dad. Like straight up identical and it is so cute. As a baby, she really looks like my mom and my grandma. She even sometimes looks like my mom’s cousin! It’s crazy. And when her and Max are right next to each other, their faces are just identical. I love everything about her. Her little legs and chins and the fact that she barely has any hair (omg that bald head is just too cute) and how she grabs her pacifier out of her mouth to play with it but is then pissed that it’s not in her mouth. She kills me and I adore her. I just feel so lucky that I could cry constantly. Like why do I get to be this lucky? WHY HAS BEING A MOM MADE ME SO EMOTIONAL!? OMG. It’s the best thing in life for me and helps keep me grounded. If I’m having a stressful day, sitting down and holding my kids changes everything. Sweet and Spicy Roasted Cauliflower. Emilia is truly to die for…the smile, the chubbiness, the expressions. Looking at the photos, I can almost hear her giggling and chattering. You have shared so much of your children and your thoughts about being a mom. it is so inspiring to read. You are honest, funny and real. I love reading the posts and thank you for sharing. Love. My “baby” is 9, so I’m so far removed from this age, but I still feel like I was just there. HA! I was watching my bff’s 6 month old today and telling my boyfriend how much I love babies. He thought I was weird. How can you not love the smiles and rolls and cute little laughs?! Reading these updates from you are so fun. Thanks for sharing! Seriously love her. I’m obsessed. So freaking cute. and I LOVE the way Max interacts with her. A few months ago you posted an insta story of him saying “Hi pretty girl” to her and I think about it all the time. I know you’re so crazy busy but I wish you would post more pics and videos of them on insta stories. I can’t believe how fast they’re growing! Love these posts! Never stop! She is the smiliest, cutest little dumpling. I loved reading your baby updates with Max when I wasn’t a parent, and I love them now that I am a parent – especially because my son Patrick is two weeks older than Emilia, so I relate (in real time) to a lot of your experiences with her. I feel you on the sleep issue – Patrick recently decided he hates both the rocking chair and pacifiers, so there’s not a lot of soothing we do before putting him down for bed (and letting him fuss himself to sleep, although the fussing has decreased in the last week or so). It makes it especially hard to get him back down after he wakes during the night (he’s on a 3-hour nighttime sleep schedule after illness knocked him off of his typical 6-hour pattern) because I also don’t want to rely on nursing him back to sleep. There’s a definite learning curve! I’m super exhausted, but it’s all worth it in the end. P.S. The headbands and turbans you have for Emilia are super adorable and make me jealous there aren’t equivalent adorable head gear for my baldie baby boy. OH how much do I LOVE her. That story about her during Max’s stomach virus–I die. I can never get enough of your updates, but especially of your frankness about how tiring it all is, and yet how much you radiate with love and happiness in it. I only hope I will handle it with half as much grace if or when we get to that stage. You are a supermama, and reading these wonderful updates is my favorite thing. Thank you so much for sharing it with us! I can totally relate to that paragraph towards the bottom about how life is so hard, but feels so full. You are right! I have an almost-2 year old and a 2 month old and I have been so overwhelmed. Unfortunately, unlike Max, my older one has had a lot of jealousy (when I’m nursing, changing the little one’s diaper, etc). But she’s getting a lot better recently and I feel like we are finally getting the hang of things, but man, this transition to 2 kiddos has been so much harder than I was prepared for. I love how you said life feels so FULL though. I hadn’t really looked at it that way before, but it’s so true. The days are crazy, but there is just so much goodness among the craziness. Emilia is so precious and I love the little things you’ve shared about her personality…taking the paci out to play and then being pissed it’s not in her mouth hahaha so funny! She makes me smile!! Just aDORABLE!! Awww she is so adorable what a great smile!! She looks so happy!!! Her sleep habits sound EXACLTY like what my son did. He just turned 6 months 2 weeks ago and it was like a switch flipped or something and he finally went back to sleeping for 8 hour stretches, so hopefully Emilia does the same for you. Hang in there! Love reading your baby updates, especially since our kiddos are about the same age. Good luck, you got this!! Love the baby updates! That is so sweet how much Max adores her!! ❤️❤️ Hang in there with the sleep. I’m awaiting the arrival of my #2 and appreciate hearing the differences from your two. Emilia is just adorable and from the very first picture of her I thought she looks exactly like Max. God bless you and your beautiful family. On sleep-are you still swaddling her at night? I have a four month old and I still feel like it helps her put herself back to sleep. She’s sleeping about 9 hour stretches in the swaddle. LOVE these posts! Keep em coming! My baby is 5 months so I went back to read your 5 month update (like I do every month!! )… all her clothes in these post are so cute!! Where are they from?